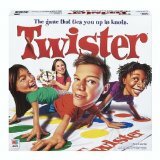 I thought of another game I would recommend for family game night, and that is Twister . Twister can be a game which is fun for all (limber) family members, and kids really love it -- because they definitely have an advantage in the dexterity department. In addition, it always produces lots of laughing, which is also a great plus for family game night. Here is a video on how to play the Twister game, for those of you who may have forgotten some of the rules since you were a kid. So, do you have any favorite games for family game night? If so, share them with us! In addition, you can see other games recommended here.